It's just that posting from the road with the brutal transfer leg schedule and the cramped car has been more challenging than I thought. We are starting day 6 today at Barber Motorsports in Alabama then right after the Time Trials we have a 700 mile leg to Autobahn Country Club in Illinois for an 8AM start tomorrow.... see what I mean? Anyway, we are first in class and 17th overall as of yesterday's Time Trials at Circuit Grand Bayou in Luisiana. 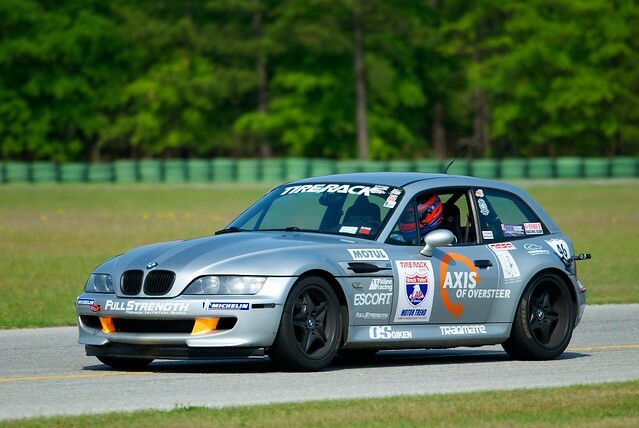 Oh, and did I tell you the old M Coupe went 158.76 MPH on the Daytona bankings? Not bad for a 10 year old car! You can check results HERE and our Flick slide show is after the jump.... no sleep till Brooklyn! Glad to hear You are doing well! What if .... (You had the Black Beast?)? I see you finally figured out your driver side marker popped out. You can see the wire and light bulb hanging on for dear life on the track in some pics.